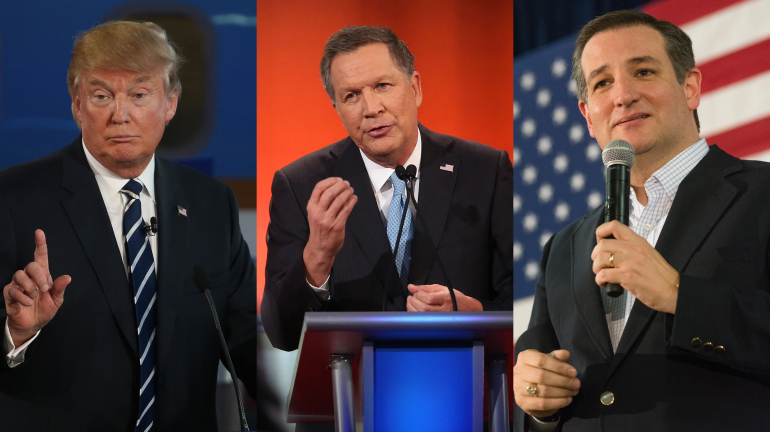 Republican Presidential candidates Donald Trump, John Kasich and Ted Cruz. (by Marisa Schultz and Chris Perez, NY Post ) — Ted Cruz and John Kasich have joined forces in a concerted effort to deny Donald Trump the delegates needed to win the Republican presidential nomination on the first ballot at the July convention. The two campaigns made the surprise announcement Sunday night, signaling a major shift in strategy days before Tuesday’s five primary contests. “Having Donald Trump at the top of the ticket in November would be a sure disaster for Republicans,” said Jeff Roe, Cruz’s campaign manager. “Not only would Trump get blown out by Clinton or Sanders, but having him as our nominee would set the party back a generation. To ensure that we nominate a Republican who can unify the Republican Party and win in November, our campaign will focus its time and resources in Indiana and in turn clear the path for Gov. Kasich to compete in Oregon and New Mexico, and we would hope that allies of both campaigns would follow our lead,” Roe explained. Indiana’s primary is May 3, Oregon’s is May 17 and New Mexico’s is on June 7. Kasich’s camp said they were fully on board with the idea, also claiming that Indiana was the key to stopping [Trump] — currently the Republican front-runner with 845 delegates. “Our goal is to have an open convention in Cleveland, where we are confident a candidate capable of uniting the party and winning in November will emerge as the nominee,” Kasich strategist John Weaver said. “Due to the fact that the Indiana primary is winner-take-all statewide and by congressional district, keeping Trump from winning a plurality in Indiana is critical to keeping him under 1,237 bound delegates before Cleveland. We will shift our campaign’s resources West and give the Cruz campaign a clear path in Indiana,” Weaver said. 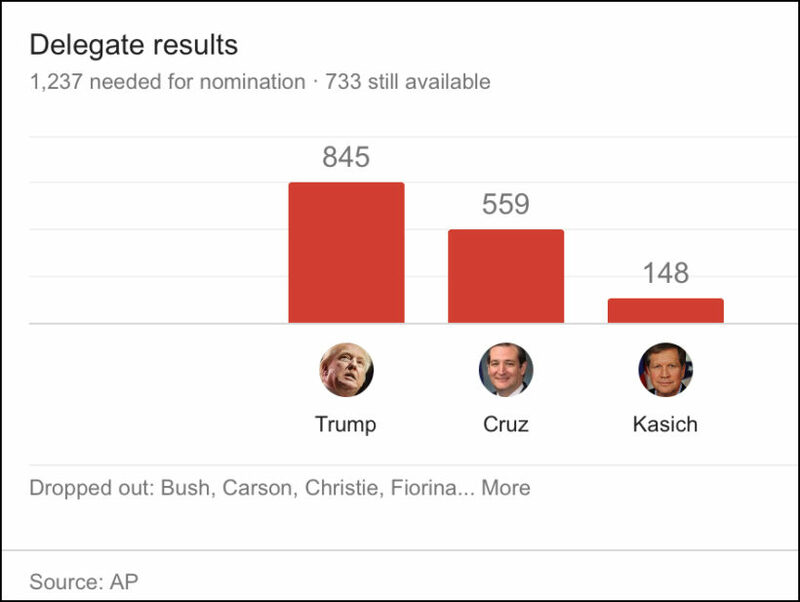 Cruz trails him with 559 delegates, as does Kasich with 148. The decision to work together is ultimately a major change in strategy for Cruz, who has tried to stay as far away from Kasich as possible. “Donald Trump doesn’t have the support of a majority of Republicans — not even close, but he currently does have almost half the delegates because he’s benefited from the existing primary system,” Kasich’s campaign said. Trump, meanwhile, was less than impressed. “Wow, just announced that Lyin’ Ted and Kasich are going to collude in order to keep me from getting the Republican nomination. DESPERATION!” he tweeted late Sunday. …..
1. What announcement did Republican presidential candidates Ted Cruz and John Kasich make on Sunday? 2. What assertion did Sen. Cruz’s campaign manager make about Donald Trump as the potential Republican nominee? 3. What did Gov. Kasich’s campaign say about this strategy to keep Trump from winning the nomination? 4. a) Both candidates say Donald Trump can’t do two things. What are they? b) Ask a parent: do you agree? Explain your answer. 5. a) How many delegates does each candidate currently have? b) How may does a candidate need to win the nomination? 6. a) What is significant about this strategy for Ted Cruz? b) Considering the number of delegates Cruz and Kasich each have, do you think Kasich should have just ended his campaign and given his support to Cruz? 7. What was Donald Trump’s reply to the Cruz/Kasich announcement? 8. a) Do you agree with the Cruz/Kasich attempt to deprive Trump the number of delegates needed to win the nomination? b) If the candidate you support is/were Donald Trump, how would you view the Cruz/Kasich attempt to deny him the nomination?